Contrary to common belief Border Collies come in a variety of different coat colours, not just the traditional Black and White. I have added descriptions of a few different coat colours below but these are by no means all of the colours of the Border Collie. Please note that currently in Australia only Black and White, Red and White, Black Tan and White Tri, Chocolate and White, Blue and White and Blue Merle are recognised by the Kennel Council. 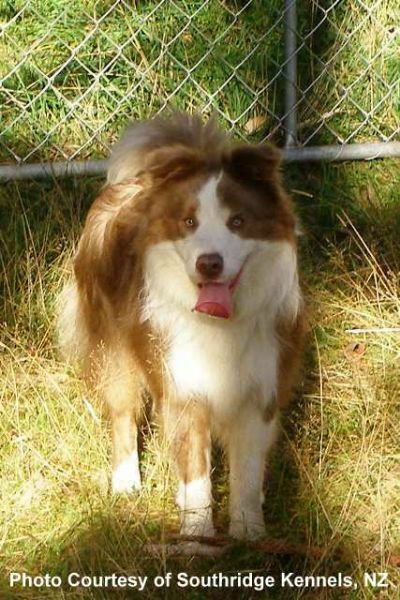 The traditional Border Collie coat colour. A glossy black coat with white points, chest, collar and blaze. The eyes can be dark brown, medium brown, hazel & sky blue although brown is the most accepted colour. 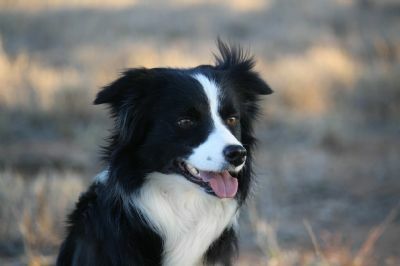 The tri coloured border collie has a black base coat with tan points above the eyes, on the cheeks, on the legs, the bottom and in the ears. 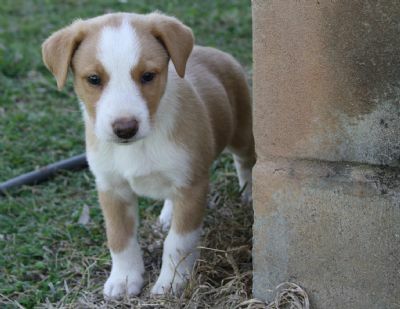 The tan markings can be light cream through to a dark golden colour and can be small or very predominant. The base coat colour can be colours other than black, for example, chocolate tri, blue tri, lilac tri and a variety of merle tris (although not all of these colours are recognised by the ANKC). The base coat colour will determine the eye colour of each individual tri-coloured dog. Merle is a coat pattern. The dog has either a blue, chocolate or lilac base coat with darker and lighter patches on the coat. Eyes of a merle dog are sometimes blue, brown or marbled. One eye may be one colour and the other may be a different colour. The nose leather can be black, brown, blue/grey, pinkish or even mottled depending on the dogs individual base coat colour. Blue is a dilute colour. It can appear as a washed out black and white to the untrained eye. 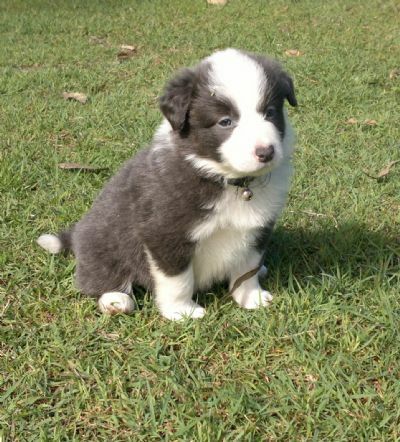 Blue and white Border Collies are a beautiful dark steel grey colour with white points, chest, collar and blaze. The eyes can be dark brown, medium brown, hazel & sky blue. They have a blue/grey nose leather. 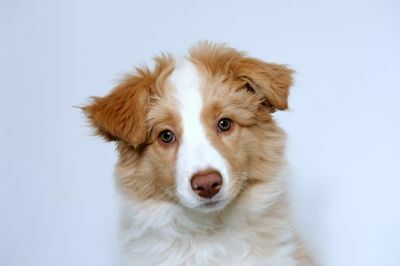 The coat colours of a red and white Border Collie can vary quite a lot. Some will be a deep red colour whereas others can be only a light cream. They will still have white points, chest, collar and blaze. Eye colour can be most colours. Nose leather will be brown or black depending on its individual genetic makeup. Our home bred red girl- Chocabloc Charlie Kerby. 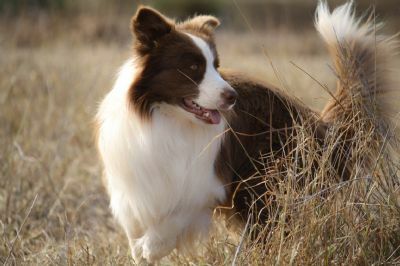 Chocolate and white Border Collies have a brown coat with white points, chest, collar and blaze. The brown base can vary from dark to light chocolate brown. The eyes will be dark brown, medium brown, greenish or even a golden yellow. Lilac and white is also a dilute colour. The main coat colour can appear as a washed out or flat shade of chocolate with white points, chest, collar and blaze. They can have brown eyes and a pinkish nose leather. 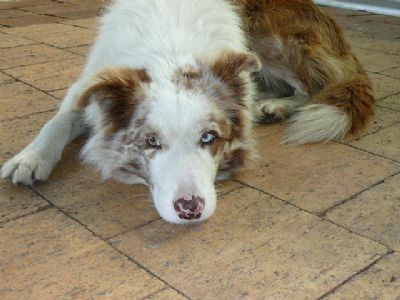 Mylo shown below is a lilac tri-colour, what a gorgeous boy! Another common misconception is that a Border Collie only comes with a long, thick coat. 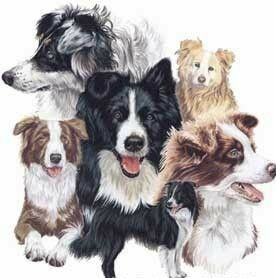 In fact Border Collies come in various coats. They can have a short, sleek coat called a Smooth Coat. 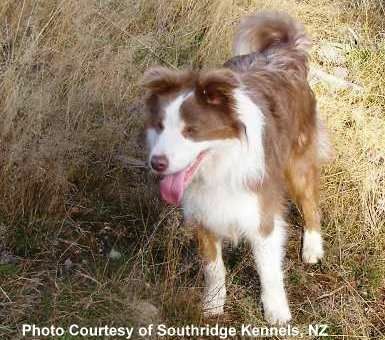 They can have a long, thick flowing coat known as a Rough Coat which is commonly seen on the Border Collie in the show ring. 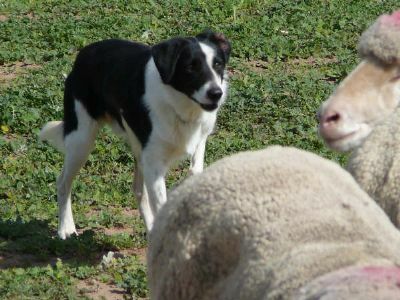 There are also variations in between these two coat lengths, such as a medium coat and the short coat which is often preferred in a working Border Collie. Then there is the coat texture, it can be fine, silky soft hair or it can be a think coarse hair and once again there are variations in between. 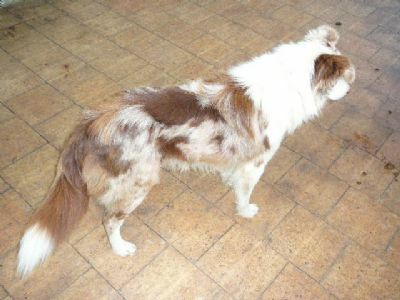 Ticking is a gene that causes flecks or spots of colour to appear in the white parts of the dog. The dog may only have slight ticking or could be very heavily ticked. Areas where ticking appear most commonly is on the legs and around the muzzle area although some dogs may have ticking over their entire body. Ticking develops over time so a young dog who displays a small degree of the patterning will most likely continue to develop more flecks/spots as it matures. Notice the ticking on Spyda's legs below. I hope you have found this information interesting and informative. It is by no means conclusive and if you go to my Interesting Links page you will find other sites that go into this information a little deeper, including information on colour genetics. 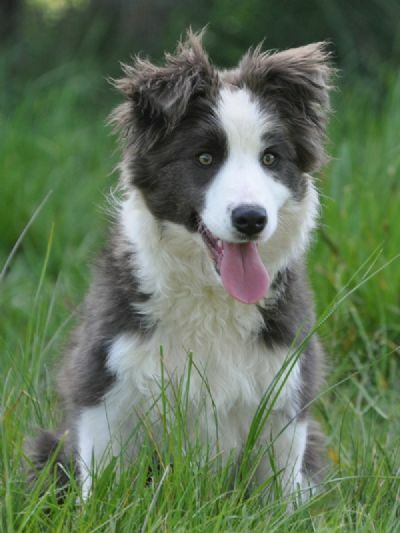 Enjoy finding out more about this amazing breed, the Border Collie! If anyone has photos of dogs in the above colours that they would like to donate to this page feel free to contact me, it would be much appreciated!